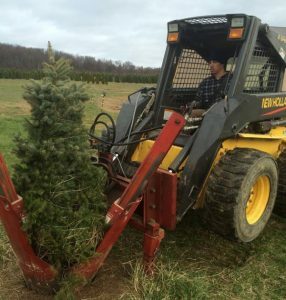 At Foothill Farm, we work hard to make sure we are providing the most beautiful and well-maintained trees to our customers. Currently, we offer five different varieties of trees: Douglas Fir, Fraser Fir, Concolor Fir, Blue Spruce and Norway Spruce. At the beginning of November we start cutting for our wholesale customers and starting Black Friday, we open up for our retail business. Find your perfect Christmas tree right here at the farm. Select a pre-cut tree or find your perfect tree in the field. We offer FREE shaking, FREE drilling and FREE baling and we’ll even tie the tree to your vehicle for you! With a breathtaking view, friendly workers, and a holiday atmosphere, Foothill Farm is the place to get your holiday season started! In addition, we can supply your dug tree needs during the Spring and Fall seasons. Whether you need 1 tree for your residence, or several hundred for your landscaping business, we are happy to help. We can also help organizations interested in fundraising. Contact us to find out about our exciting 2016 options.